This narrative applies to numerous places that have fallen victim to white, western imperialism. But Tristan Bernays delves further back in time to the Roman occupation of Britain. Those who forget history are doomed to repeat it – a prescient message in these times of political polarisation. In this story of Boudica the Icini queen’s uprising against the Romans, Bernays cannily frames other contemporary issues within a historical context: female leadership and the sexism that spawns, attitudes towards peace and war, the connection between identity and place of birth, political divides with individual families, and several others. It’s a complex thematic mix, but it doesn’t bog down the story. However, less aware audiences could miss the anti-imperialist angle. At nearly three hours, the script needs a trim – at least half an hour could go from the scenes that consist of argumentative, ideological clashes. These make their point quickly, then cease moving the action forward. The pace stumbles within these moments, lending the whole production an uneven quality. More disappointing are the prematurely truncated battle scenes – a disservice to a people known for their ferocity and a period of history notoriously brutal. Though there’s a range of viewpoints represented in the body of characters, there’s little nuance in them individually. Boudica’s daughters, Alonna and Blodwynn, are anti-war and pro-war. Together, they have a moving, thoughful dynamic. Alone, they are archetypes. The Roman Procurator is colonialism, tribal leader Badvoc is the savage. Boudica has the most inner conflict and standalone depth, with strong parallels to Greek tragic heroes. Her tragic flaw eventually destroys her, even though she briefly considers other choices. 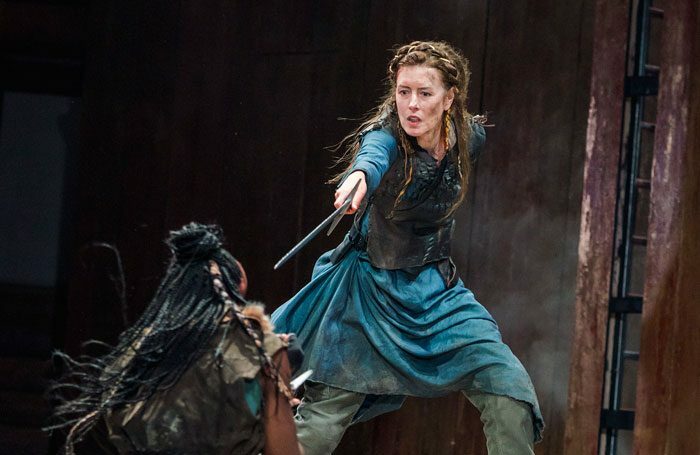 Gina McKee is a fierce, passionate Boudica and the highlight of a strong cast. Though the descendants of these white imperialists gradually become woke, the old, racist guard resists, clinging to the ideals of the British Empire in both Bernays’ play and contemporary Britain. This Boudica is a fantastic feminist hero, and director Eleanor Rhode instinctively taps into her vibrant pulse. Some cuts to the text and focusing the wild energy that dashes through this production would go a long way here, but these shortcomings don’t detract much from the show’s spirit. It’s a good show, with clear potential to be great. Boudica runs through 1 October.